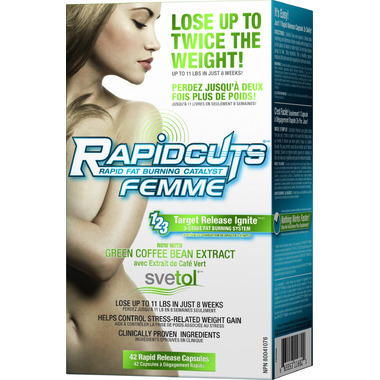 RAPIDCUTS FEMME is the world’s first female fat burner designed to intelligently target, release and ignite stored body fat at speeds never before achieved by science. With Rapidcut Femme you can lose unwanted body fat and improve body firmness in as little as 12 weeks. I was disappointed with this item. No where does it say that it has coffee bean in it . Had I known that before I bought it would not have bought it. Coffee bean for weight loss does not work for me. I wish they would have had a better description on this item.